Seven years ago when I spent $10 to buy my domain name and start my blog, I had no idea how much my life was about to change. Blogging has transformed the way I live my life. I’ve loved writing since I was a child, and I am amazed every day that I get to do what I love and get paid for it. Blogging is just like anything else, though. It takes a lot of hard work, and every now and then I need a little boost. Last year, I got in a bit of a rut when it came to my blog and my business. I knew there had to be a better way to blog, but I had no idea how to find it. I felt like I was working so much on my blog and not getting anywhere. I couldn’t understand why other bloggers were making such high incomes and such an impact and why my income wasn’t going up at all. And then I discovered Elite Blog Academy. Elite Blogging Academy is the most comprehensive course on blogging in existence. I wish it existed when I first started my blog. When I discovered it, it seemed like the perfect solution to my problem, but I was still scared to take the leap. The primary reason is that the course was expensive. It’s $797, but they do an option for you to pay in installments. I wavered back and forth on if I needed to spend so much to learn how to blog better. After all, I was already making a full time income from my blog. Ultimately, though, I knew I would never get unstuck on my own, and so I I decided to take my chances and enroll. In the time since I started Elite Blog Academy, I have dramatically improved my blog. I deleted over 400 posts that didn’t convey my primary brand message. I organized my categories. I started to write more posts that mattered and less fluff. I loved the course so much that I’m actually going through the entire thing again right now starting with Unit 1. Yes, it’s actually that good that I’m doing it a second time. Elite Blog Academy is for people who either want to start a blog or who want to improve the blogs they already have. It’s for people committed to following the process and actually doing the work. As a member of EBA, I’ve noticed that the thing that the most successful graduates have in common is a willingness to put 100% of their effort into completing the assignments in order. 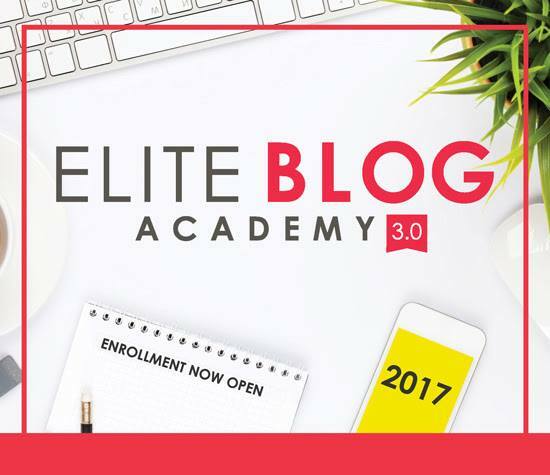 Enrollment for Elite Blog Academy only opens ONCE each year, and will only be open this week! And, here’s the great news: If you enroll in Elite Blog Academy using the link above, as my bonus to you, I will enroll you in the Junior Level of my course, Get Paid to Write for Blogs, for free! I truly believe that having these two courses together will make you unstoppable. Elite Blog Academy is the best course in existence for building a profitable blog and my course, Get Paid to Write for Blogs, has 29 extremely detailed videos that will show you how to use your new and shiny blog as a platform to get highly lucrative freelance writings jobs online. So, if you’re interested in blogging as a career whether you have a blog right now or not, this week is the one week of the year where you can make a difference in your life and take the steps you need to move forward. If you decide to go ahead and enroll in Elite Blog Academy using the link above, send me an e-mail and let me know that you did so I can enroll you in my course as well! Thanks for introducing EBA! It seems like it’s helped you so much and it is part of your success and where you are now today. Thanks I’m excited to go back through it again! Thanks for this offer. I’m not ready for EBA yet, however, I will go for your Get Paid to Write for Blogs course. I got to your blog from the interview you had with Michelle of Making Sense of Cents. Hi Paul! Great to hear from you. Would love to have you in my class anytime!